and am now a third degree black belt in taekwondo! me to do to the best of my ability and that I answered the questions they asked me well. I was hoping to board break, but they didn't ask me to do that. I wanted to answer: "My age." And when they would ask what that was, I was going to answer: "26." I thought it would have been funny, but they didn't ask. 2. 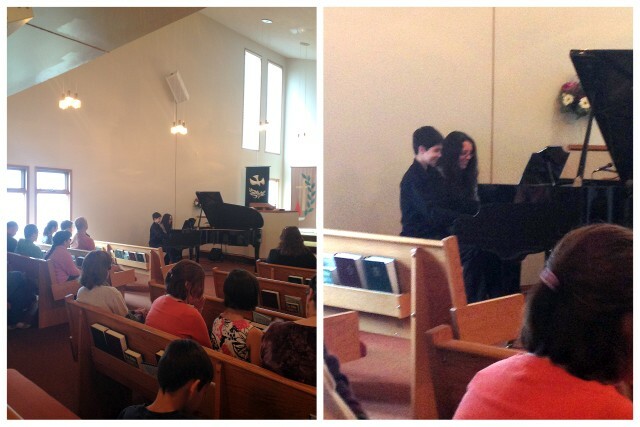 Jonah had his piano recital on Sunday afternoon. He played two solo pieces and we got to play our Mission Impossible duet together again. He's had a great year. He started with a new teacher in the fall, but it's been a great fit. She's super encouraging and very talented. Jonah and I are in awe of her! And, he said he'd continue with piano lessons in the fall -- yay! 3. 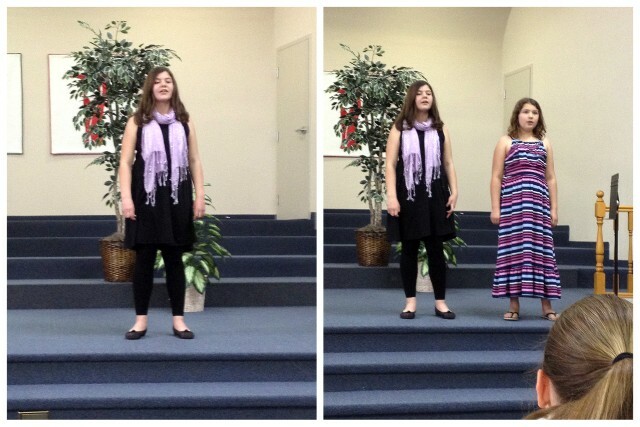 Sage had her voice recital on Monday evening, which went very well. She sang two pieces by herself and one with her friend, Faith. so hopefully she will be a great fit for Sage, too. 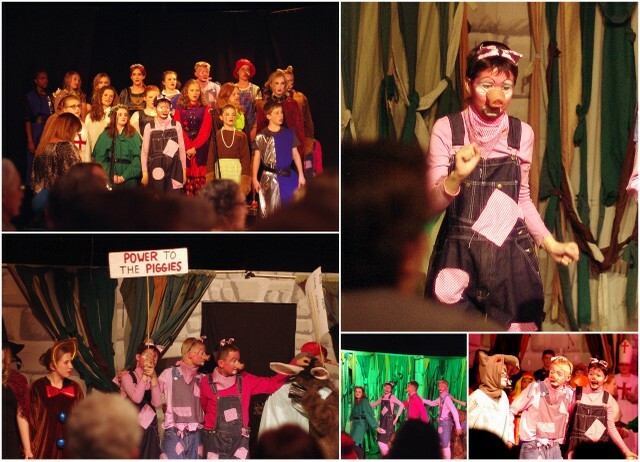 First of all, he played the part of one of the three little pigs in Shrek Jr. So much makeup! But he looked adorable! He sang with the choir and acted on stage. He even danced -- it was so fun to watch! His expressions were priceless and he was always engaged. where they dress up in costume and host the parents for lunch. We rented his costume -- doesn't he look amazing? as well as be the Lord of the Feast, where he emceed everything. I think it's so fun that their school does this each year! the sweet giraffes from Lift Me Up. patterned paper for both of my cards. and coloured him in using Zig Markers, some water and a paintbrush. 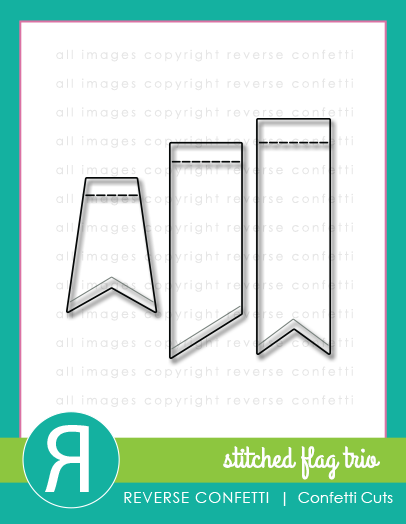 that I diecut using a Stitched Flag Trio Confetti Cuts and trimmed down. A trio of buttons and twine finishes it off. except that I opted to not include the banner. And I tied on only two buttons instead of three. I love all the pictures of your family with their end of the year recitals and plays. The joy in their faces is beautiful! And way to go on Taekwondo. You are incredible! Your cards are the cutest! Those two cards are so sweet - somehow I always struggle with baby cards, why I don't know. Love the continuing adventures of the Penner family! Your kids are so diversified and well socialized - music, theatre and sports. You're really giving them a wonderful base for all of life's coming experiences. Congratulations to you and your husband. And third degree black belt for you? Wow! So much joy in this post! Congrats to you and your sweet kiddos on all your accomplishments! 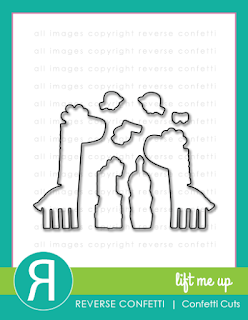 And after all that you go home and make these sweet baby cards! Love your Friday posts, my friends! You guys always have so many great things going on! Congrats to the kiddos on their performances, and huge congrats to you on your Taekwondo testing! You guys rock! And love your cards! I am a sucker for the little critters and these are adorable! what fun pics today Leigh - and such a cute card too!! Congrats Leigh, looks like you had a very successful week!! 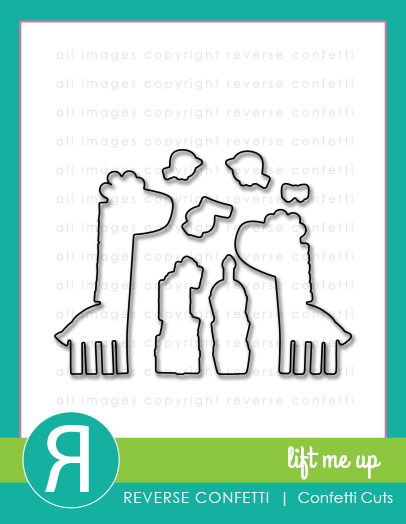 Love your 5 on Friday Leigh and your cards are so adorable! Mega congrats to you as a artist, as a mom and as a role model!! What an awesome time you've all had!!! Congratulations! You and your family certainly have been busy, Leigh! Congrats on earning your belt! I love your card, simply adorable!! Third degree black belt! That is pretty impressive!! Love the pictures of your kids. Looks like you are a busy mom! And of course your card is adorable as always! A great update post Leigh, you and your kids are doing amazing things! Love your cards! 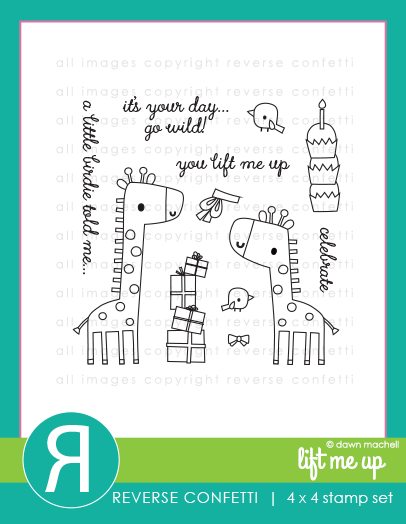 Love these sweet giraffe cards! I need to make a welcome baby card and I just may have to CASE you. 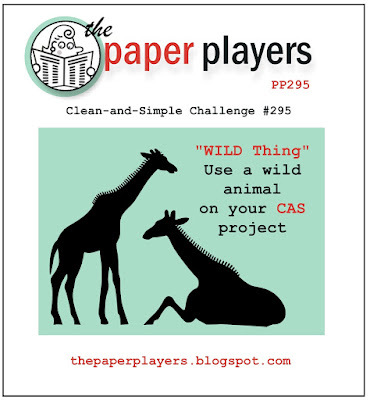 Thanks for playing along with LeAnne's Wild Thing challenge this week. So many fabulous achievements Leigh for you and your family - you must be so proud. 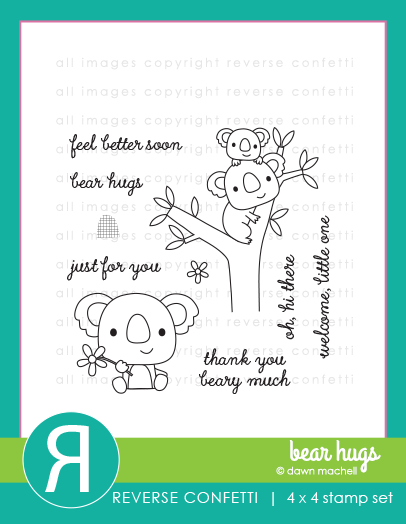 And a super-cute baby card to boot! Thanks for joining us over at The Paper Players this week! Congratulations on your Taekwondo black belt! I can't even imagine all the hard work you put into that achievement! Bravo! And I'm so impressed that among all the events with your kiddos you still managed to make a couple of terrific cards. You go Wonder Woman! CONGRATS on your black belt, way to go!! Terrific pictures of the kiddos and all their happenings. Adorable cards too!! Oh, my gracious! So much going on! LOVE all the pics, Leigh! And congratulations on your third degree black belt! You go, girl! Oh, and I can't forget your darling creations... I NEED that giraffe! LOVE it to bits and pieces!